When I think of confetti, I think of a crazy, fun time and I tried to express that feeling in this card design. Do you feel like partying now? Also, I have another fun fact to share — The “happy” and star cuts will be offered in my very first CraftSwag MiniWorkshop — so consider this a sneak preview! The first Mini-Workshop will share simple techniques on how to jump-start your creative flow. The CraftSwag Classroom will open May 2014! Keep me in your thoughts as I nervously begin this new adventure! This entry was posted in Card Challenges, Card Making and tagged card crafts, card making, card making techniques, Confetti. Bookmark the permalink. totally awesome, Tyra! adore your confetti banners! I totally agree with your thoughts on confetti. I think of happy times and celebrations and your card certainly says that and more! this is one great card. love your happy and that frame with the fun banner. thanks for playing with curtain call. I love your fun card…awesome colors and details! 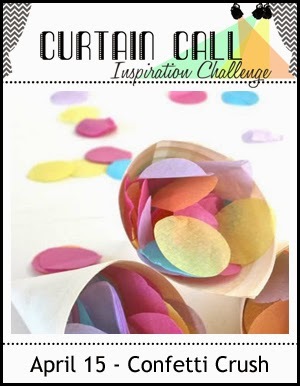 Thanks for joining us at Curtain Call – Confetti Crush! Girl…..this card is off the chain AWESOME!! Thanks for playing along at the Curtain Call! !